Consumer safety officials say drop-side cribs made by Stork Craft can cause suffocation or other injuries. Drop-side cribs have been recalled by the thousands this year due to hardware malfunctions that could cause infants to be wedged between the mattress and crib wall. Just 27 vehicles this year meet the Insurance Institute for Highway Safety's new, tougher standards. NEW YORK (CNNMoney.com) -- The federal agency in charge of product safety announced the recall of 2.1 million cribs Monday, citing defective hardware that can cause toddlers and infants to suffocate. The Consumer Product Safety Commission said parents should immediately stop using Stork Craft drop-side cribs, which are made by Stork Craft Manufacturing Inc., of British Columbia, Canada. About 1.2 million of the cribs have been distributed in the United States and 968,000 units distributed in Canada. The recall includes about 147,000 Stork Craft drop-side cribs with the Fisher-Price logo, the CPSC said. The cribs were sold at major retailers including Sears and Wal-Mart and online at Amazon.com and Target.com between January 1993 and October 2009. The CPSC said the cribs' drop-side, which is attached with plastic hardware, can detach unexpectedly and create a space between the crib wall and the adjacent mattress. Infants and toddlers can become trapped in the space and suffocate or fall to the floor, the agency said. There have been 110 documented incidents of drop-side detachment, including 67 in the United States and 43 in Canada. Among those, four resulted in suffocation and 20 resulted in falls that caused injuries ranging from concussion to bumps and bruises. It was the second time Stork Craft cribs were recalled this year. In January, about 535,000 were recalled amid safety concerns. Safety advocates have urged federal regulators to impose tougher standards on companies that make drop-side cribs and some have called for an outright ban. "CPSC is working on new federal rules to make all cribs safer," said agency spokesperson Scott Wolfson. Before Monday's announcement, more than 5 million cribs, bassinets and play yards had been recalled since the beginning of 2007, according to CPSC. This includes the recall of 400,000 drop-side cribs by manufacturer Simplicity in July, as the result of some fatalities, according to the CPSC. The agency also said that 600,000 drop-side cribs were recalled by Delta Enterprise in October. The recalls were prompted by concerns that infants and toddlers could get trapped by the mechanism of the crib and suffocate. "This has certainly been a hazard that we've been aware of for some time," said Nancy Cowles, director of Kids In Danger, a Chicago-based advocacy group. Drop-side cribs have been associated with "dozens of deaths" over the years, she added. 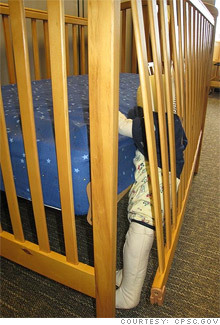 Toys "R" Us, one of the largest retailers of nursery furniture, said it has decided to stop placing orders for drop-side cribs and expects to stop carrying them by the end of 2009. Jennifer Albano, a Toys "R" Us spokesperson, said the company supports proposed standards that would, among other things, require that cribs no longer be manufactured with a drop-side. Albano said a consortium of crib manufacturers, consumer safety advocates and a products standards organization met with the CPSC in March to discuss the possibility of changing voluntary production standards for cribs as part of ongoing efforts to improve safety. However, no official decision has been made and Toys "R" Us does still have some drop-side cribs in stock, Albano said. Major retailers in the United States and Canada sold the recalled cribs including BJ's Wholesale Club, J.C. Penney, Kmart, Meijer, Sears (SHLD, Fortune 500), USA Baby, and Wal-Mart (WMT, Fortune 500) stores and online at Amazon.com (AMZN, Fortune 500), Babiesrus.com, Costco.com, Target.com (TGT, Fortune 500), and Walmart.com from January 1993 through October 2009 for between $100 and $400. Meanwhile, the legislature in Suffolk County, N.Y., at the eastern end of Long Island, banned sales of the drop-side crib in October.